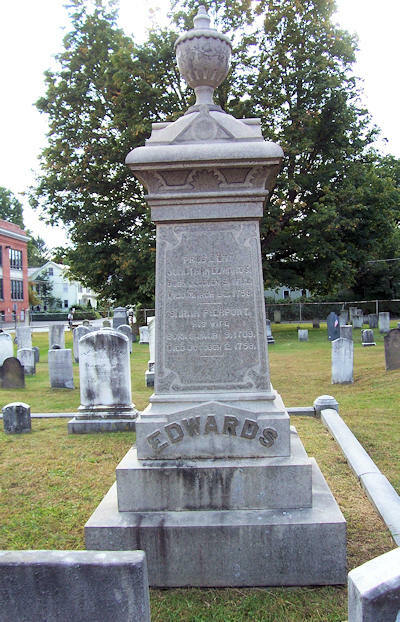 Although Jonathan Edwards is buried in the Princeton Cemetery, Princeton, New Jersey, there is a tall 19th century cenotaph for him (and his wife) at Bridge Street Cemetery, that lists all their children (Sarah, Jerusha, Esther, Mary, Lucy, Timothy, Susanna, Eunice, Jonathan, Elizabeth, Pierpont); as well as another smaller cenotaph to the right of the gravestone of his daughter, Jerusha Edwards. From the front of the Bates family memorial (near southwest corner of cemetery), look toward the school across the street from the cemetery and you will see the tall cenotaph for Jonathan Edwards. See grave of David Brainerd for directions to Cemetery.